Vocal student Marissa DeBarge, right, sings in front of the special guest Lee Hoffman to receive feedback to be a better performer. The voice workshop wast hosted by ARC adjunct professor of music Catherine Fagiolo, left, at the music department on April 14, 2016 (Photo by Itzin Alpizar). 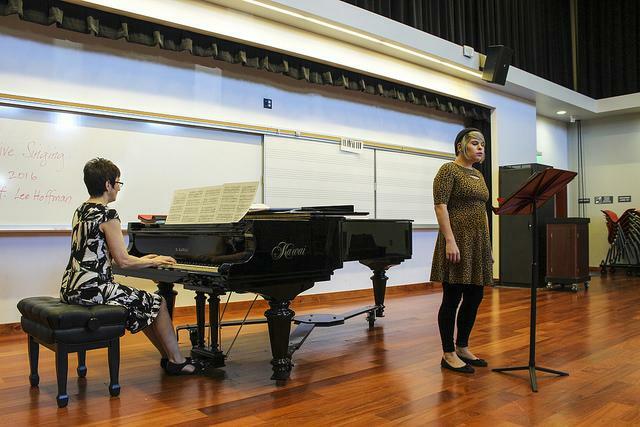 American River College’s adjunct music and voice professor, Catherine Fagiolo, hosted the third vocal workshop of the spring semester on Friday, April 14 with special guest Lee Hoffman. Hoffman was providing professional feedback for the singers. Hoffman, a soprano, is currently the director of the choir at Westminster Presbyterian Church in Sacramento, where she conducts the Chancel Choir, Handbell Choir and the Praise Band. She taught voice at several universities in Ohio, Kentucky, Cincinnati and Missouri states and is a member of the National Association of Teachers of Singing (NATS). The workshop consisted of students presenting the songs they are currently working on and receiving feedback from Hoffman and Fagiolo on how to be better performers. Hoffman said that the benefit of these kind of workshops is that you learn what to do and what not to do. “This is why I like to do this [workshop], so the [students] would feel more comfortable singing in front of others,” said Fagiolo. The students learned that being more expressive with their bodies would make them better performers. “The more you can master your capabilities, the more options you will have,” said Hoffman. During the workshop, Hoffman made some students walk around the room singing while demonstrating better posture and singing with different emotions. She recommended yoga, acting classes, and even swimming to free their bodies and be more expressive. “Act as you are wearing a beautiful tuxedo, and you are a king, and you have just been crowned,” said Hoffman. Julia Pearson, an ARC nutrition major, said that she loves the workshops and she’s done at least three of them this semester. She sang “Vittoria Mio Core” by Giacomo Carissimi. Hoffman recommended that she present herself with more confidence on stage. “That (stage) belongs to you, that is yours,” said Hoffman. The youngest singer on the workshop was Gianna Compagno, 15, from Ponderosa High School. Compagno is also a new student of Fagiolo’s independent studio for singers and pianists. She has been playing the piano for nine years and this was her first time singing classical music. Fagiolo and Hoffman expressed their admiration for Compagno’s voice and said they would like her to come to study at ARC. Fagiolo invites students from all disciplines to participate in the upcoming workshops in the fall semester. Fagiolo and Hoffman met around a year ago at NATS and described having a great experience working together. “Being able to connect is truly important. 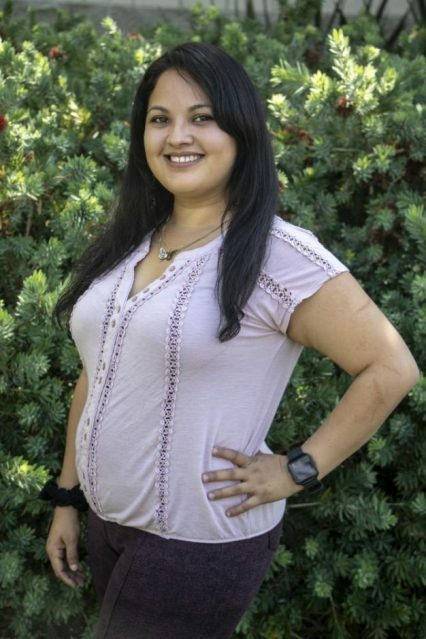 It is wonderful to have colleagues who get you out, people that you respect, build you up and help each other to get better,” said Hoffman who plans to come back to ARC to do another workshop.